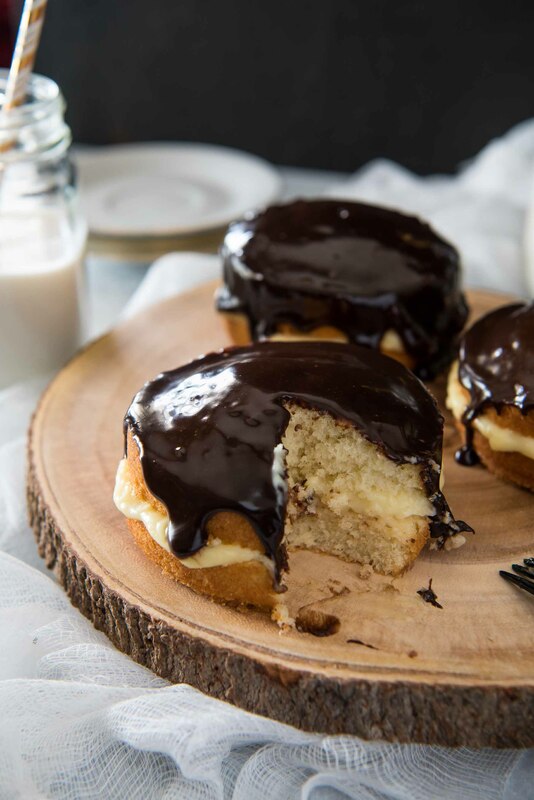 There’s nothing quite like a classic Boston Cream Pie…since it’s actually a cake! 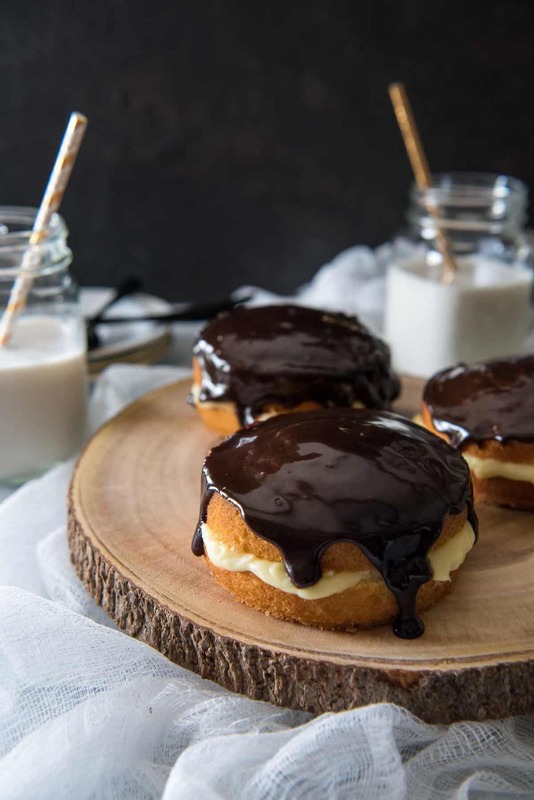 Rich, thick pastry cream is sandwiched between two layers of buttery yellow cake, then topped with a dark chocolate glaze. This post is sponsored by Florida Dairy Farmers in conjunction with a social media campaign through Sunday Supper LLC. All opinions are my own. Thanks for supporting the brands I love that make this blog possible! We’re over the hump! Happy unofficial summer, friends! Memorial Day has come and gone and, at least in Florida, we’ve already been calling it summer for weeks. Obviously, that means…a lot of indoor activities, in my case. I love being outside, but not in 95-degree plus heat. Instead, I’ll be spending a good part of the next 5 months playing in the kitchen and sharing tasty new recipes with you as often as possible. I’ll also probably be bingeing a lot of TV at the same time. When I was younger, the idea of watching anything on DiY, HGTV, or The Food Network would cause my nose to turn up in disgust. Who would waste their time watching people craft and cook? Obviously, over the last few years, I have come to terms with the fact that I’ve become the very person I scoffed at before. Now, if I’m not watching a sitcom or Game of Thrones, I’ve got some sort of baking show on in the background while I work. My favorite show lately has been Netflix reruns of The Great British Baking Show. If you didn’t already know, I’m a little obsessed with all things British, anyway, so it makes total sense that I would watch them on TV, too. There’s just something about the show that’s so fun and so different, aside from their quirky accents and playful mannerisms. The main draw for me, though, is the variety of cakes, breads, and pastries that are made on the show. 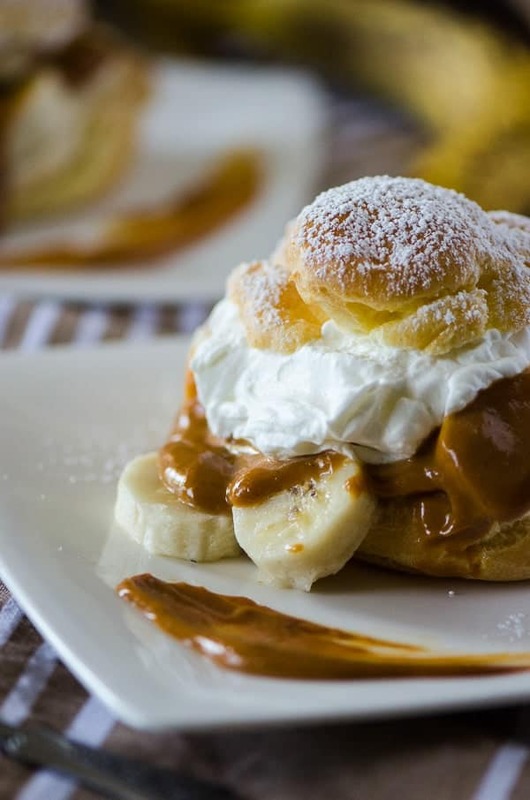 They’re so elegant and complicated, they almost make American desserts seem lame. Except when you actually bake some of those American desserts, you find out that’s not the case at all. June is National Dairy Month, and I’m celebrating all things Guernsey with the Florida Dairy Farmers Association. And Ayrshire and Holstein, too – about 120 thousand of these hard-working dairy cows live down here, raised by over 100 dairy farming families. 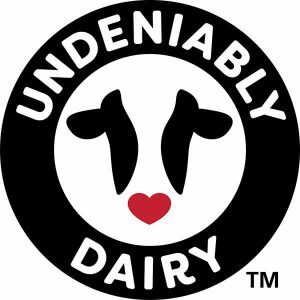 Together, they produce over 270 million gallons of fresh, quality milk each year, which equals a whole lot of sweet desserts! I’ve never whipped up a homemade classic Boston Cream Pie, but after testing out my crème pâtissière making skills a la Mary Berry, I knew I needed something special to put it in. 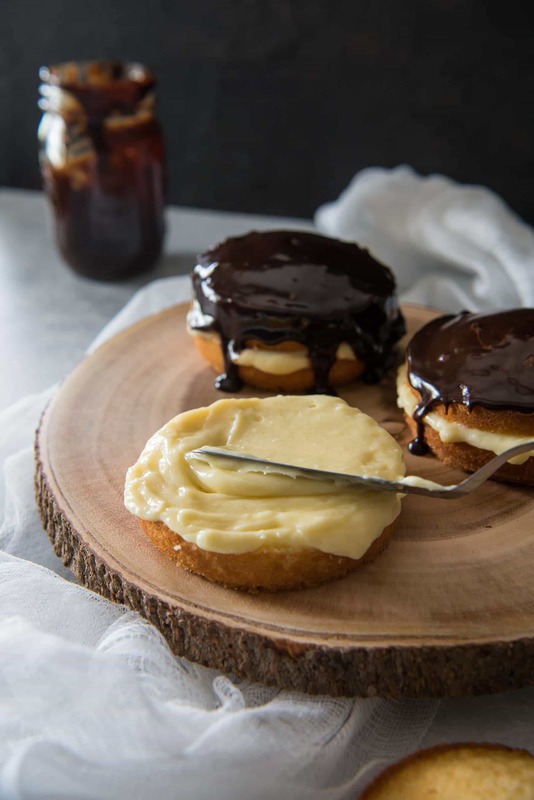 And while it may be simple, Boston Cream Pie is incredibly special. What’s not to love about the 3 Cs – cake, custard, and chocolate? My favorite part about this dessert? The size. 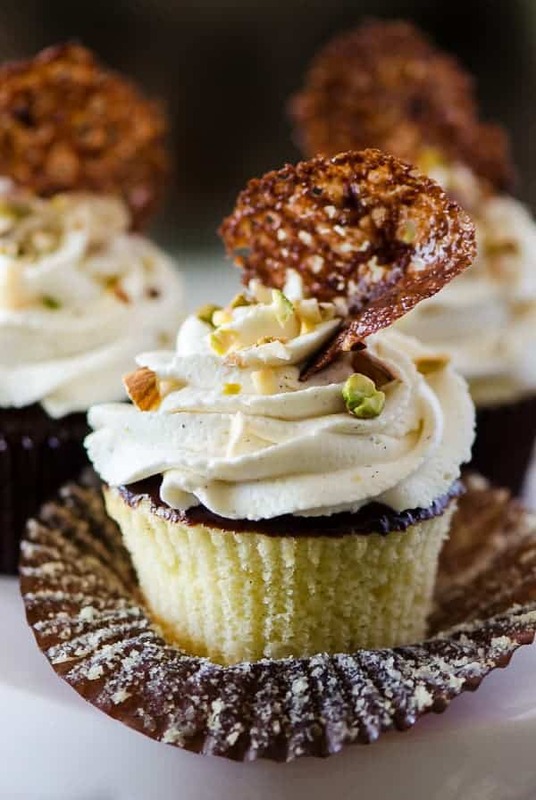 Small desserts make my heart happy (probably the reason I love cupcakes so much.) The fact that this recipe is so easily scaleable makes it a total winner since you can make just enough cake for one dinner, or big enough for a dinner party. The Hubs and I are committing to a lifestyle change that includes a personal trainer, so our diets need to shift into a smaller, more portion controlled realm. That doesn’t mean we’re not going to taste test everything that goes on the blog, though. So…we need recipes like this. And probably a handful of the ones on the Florida Dairy Farmers website, for that matter. Milk isn’t what it used to be – it’s not just meant for mixing with chocolate or drowning in cereal anymore. We love to use it as the base for our recovery shakes, mixing it with protein powder for quick meals after our workouts. We’ve also been pouring it over oatmeal, then topping the whole thing with sliced bananas and nut butter for an on-the-go pre-workout snack. Grabbing a glass when you just need a quick pick-me-up isn’t unheard of, either. Especially if you do end up mixing it with chocolate. Not only will the vitamins nourish your body, the throwback to your childhood will perk up your spirit a little bit, too! 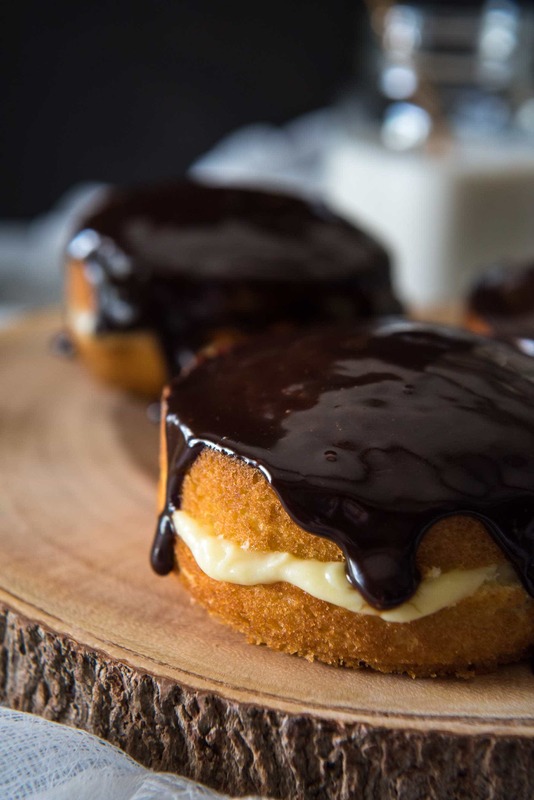 There's nothing quite like a classic Boston Cream Pie...since it's actually a cake! 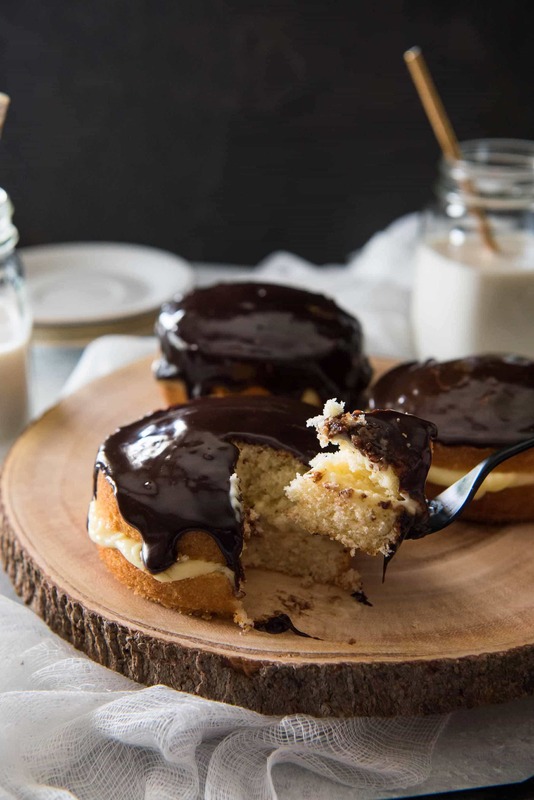 Rich, thick pastry cream is sandwiched between two layers of buttery yellow cake, then topped with a dark chocolate glaze. Preheat oven to 350F. Grease 3 4-inch springform pans with butter or cooking spray. Set aside. In a small saucepan set over low heat, heat milk and butter until melted. Remove from heat and cool slightly. In a large mixing bowl, beat together the sugar, egg, and vanilla until pale and thick. Beat in milk and butter mixture until smooth, then whisk in flour mixture. Scrape down the bowl. Portion batter into prepared pans and bake for 18-20 minutes or until a toothpick inserted in the center comes out clean. Cool completely. In a large saucepan, warm the milk until hot but not boiling. Remove from heat and set aside. In a small bowl, whisk together the egg yolk, sugar, cornstarch, and salt until a paste is formed. Whisk some of the hot milk into the egg mixture to temper, then pour the mixture back into the saucepan. Cook until boiling, about 1 minute, whisking constantly. Once boiling, whisk for 1 additional minute or until the custard thickens. Cool to room temperature and then refrigerate for 1 hour before using. Place the chocolate in a heatproof bowl. In a small saucepan, heat the cream, corn syrup, and vanilla until hot; do not boil. Pour the warm cream over the chocolate and wait 1 minute before whisking together until smooth. To assemble: Working with one cake at a time, cut in half horizontally. Spread ⅓ of the prepared custard onto the bottom half, then top with the remaining half. Spread the desired amount of prepared chocolate ganache on top. Repeat with the remaining cakes. Chill until ready to serve; let sit at room temperature for about 15 minutes before serving. Follow our friends, the Florida Dairy Farmers, on all their social media channels and celebrate June Dairy Month with them! Looking for more cake? How about a few more milk recipes? Oh you’re killing me here! 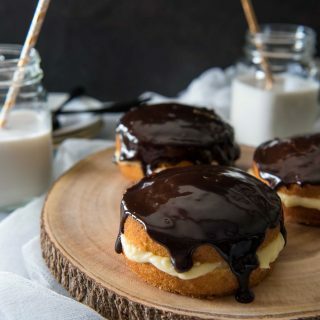 Those Boston cream pies look so good! 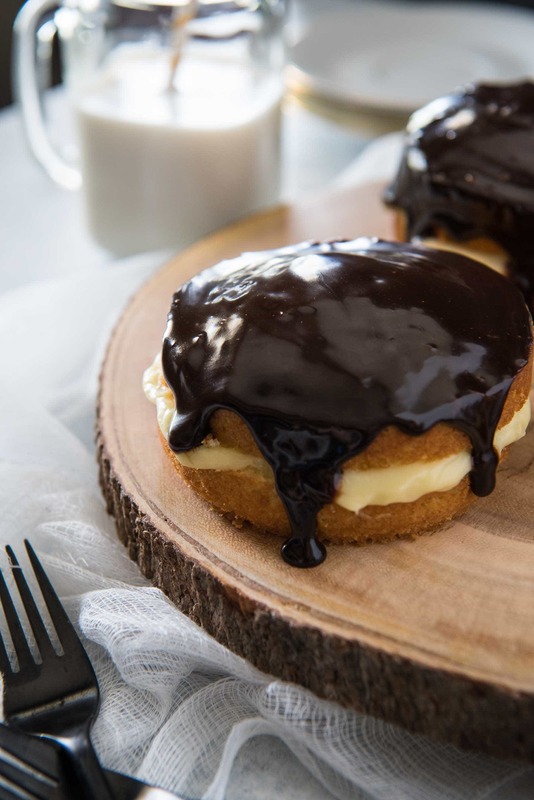 I always buy a Boston cream donut every time I go to Tim Hortons. I always say I’m going to try another donut, and sometimes I do, but I’ll always get the Boston cream one too. Love Boston Cream Pies, and everything is better mini! These look delish! 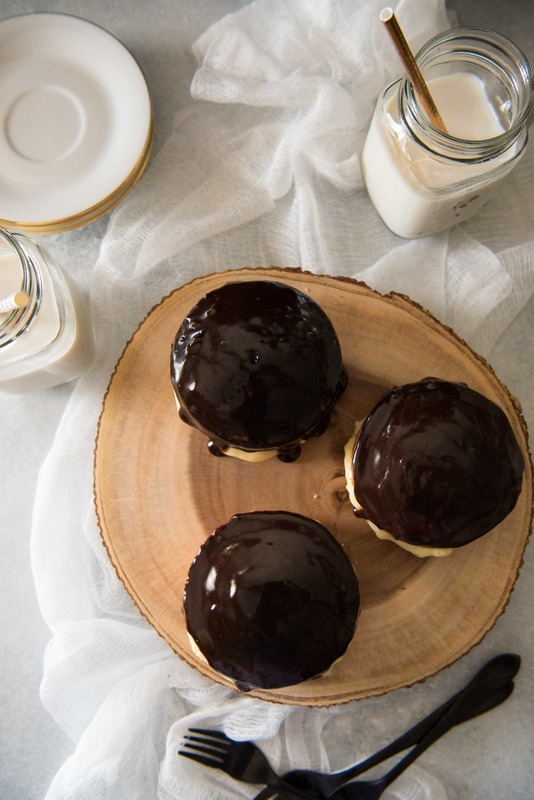 Thank you for sharing these Mini Boston Cream Pies. They look fabulous. I can’t wait to try them. Shared and Pinned. I made these and they were absolutely delicious! Any way of making this into a whole cake to serve more people?